On Saturday, June 8, 2013 at the Park's Amphitheatre, Friends, friends of Friends, members of the three levels of Government, and Park employees celebrated the 25th Anniversary of The Friends of Presqu'ile Park. 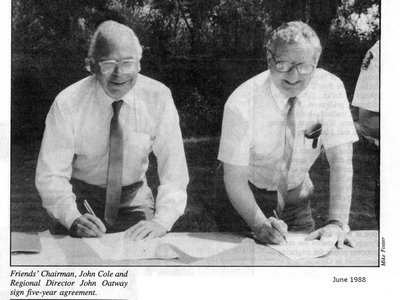 In 1988, John Cole and the original Board had a vision that "the Friends will help further the achievement of the Park's goals by allowing volunteers from the local community to actively assist Park staff with educational activities, publicity, and the production of high quality Park related publications”. In July of that year, The Friends of Presqu'ile's Chairman, John Cole, and Regional Director of the Ministry of Natural Resources, John Oatway, signed a five-year agreement to ensure the improvement of Presqu'ile's educational programs and services. Over the past 25 years, The Friends have not wavered far from that path. Members of that original board have remained in touch with the organisation and the Park. Original Board members Liz Chatten and Glenn Spence planted a maple grown from Presqu'ile seed as part of the celebration. The organisation has successfully been consistent in supporting the mandate. 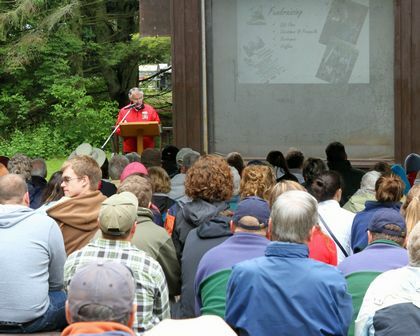 During the period from 1988, Park Management estimate that The Friends have generated over $5 million of worth in capital assets and volunteer hours spent in supporting the Park. Educational programs have been constantly updated in line with school curriculum's and latest thinking. The Lighthouse Interpretive Centre and Nature Centre displays have been provided and updated and interpreters have been recruited and payed for by The Friends to run these facilities and provide the programs. Acting Superintendent, Rob Cunningham, explained how grateful he and Park Management are about the Friends support and involvement in these activities as well as replacing major assets such as The Marsh Boardwalk and Jobes Woods Trail. These have been totally rebuilt by The Friends, providing the materials and volunteer labour to complete these and similar projects. To celebrate the Anniversary, The Friends have launched The 25th Anniversary Environmental Fund which will provide dependable long-term support for environmental programs at Presqu'ile Provincial Park such as invasive plant control, habitat protection and regeneration, and wildlife and ecology research.